In Kenya, where sixty per cent of all agriculturists are small farmers with less than 5 hectares (ha) of land, Peter Saku is an interesting case. A marginal farmer of Kifurusha village in Kenya's Machakos district, he grows 11 different kinds of produce on his meagre 0.5 ha. What makes this an achievement is that he farms in a country where only 15 per cent of the land is arable, rendering extending cultivation extremely difficult. The key to his success? Effective water conservation techniques. Saku's was not always this successful. In 1998 he grew just one crop, maize. That earned him a paltry income of Kenyan Shillings (ks) 4000 (about us $52). "There was extreme water-shortage and planting any other crop would have been a disaster," he says. Most farmers in Machakos had a similar predicament. Inadequate rainfall, scarce water supply (in 2002 it was 17 million cubic meters as against the demand of 47 million cubic meters) and paucity of land (the density of population here is 150 people per square kilometers) had made agriculture a difficult proposition in the district. Having rainwater-harvesting structures would mean precious agricultural land gone -- unless, these structures did not take up much land. This was precisely the benefit offered by the Regional Land and Management Unit (relma)-developed plastic-lined pond and sausage-shaped underground tank. During a drought Saku saw the utility of these water storage structures, from close quarters, when Kifurusha suffered a severe drought in 1998. He was assisting a Swedish researcher Lenny Baron in collecting data in his village, then. Baron's premises, which were equipped with the plastic-lined pond and tank, faced up to the calamity much better than the rest of the village. This impressed many villagers including Saku. "The quality of rainwater was much better than the river water, the main source for the villagers," says Saku. "Noticing my enthusiasm, relma helped me construct both the structures," he adds. The open rectangular tank at Saku's farm is 10 metre (m) long and 2 m deep and has a storage capacity of 80 m? The tank is lined with a 0.88-milimetre thick high-density ultra-violet resistant plastic material, which minimises seepage losses common in most areas with sandy soil. A 0.5 m high brick wall is built around the tank to keep the plastic lining in place. T he pond was made at a total cost of ks 31,600 (about us $415). 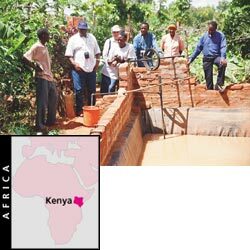 the Kifurusha farmers provided the labour and locally available material such as sand, bricks and stone (a total cost of ks 8,600 or us $113). relma provided them with the other raw materials and guided them on matters of design and construction (a total cost of ks 23000 or us $302). The other structure, the underground tank was also built on the same cost-sharing basis. Says Saku, "the underground tanks are cost-effective and suited to the requirements of Kifurusha. They protect the water from evaporation loss and reduce hydrostatic force, so the tank does not require water reinforcement." The structure can be used to harvest and store water from the roof catchment or from the runoff. Most importantly says Saku, "crops can be planted on soil above the tank, thereby using the using the space effectively." Saku did have some problems with one of the underground tanks. Poor joints, inappropriate mortar mix and inadequate curing process led to seepage in one of them. But overall, Saku's has been a success story. Now he has also started harvesting rainwater from an adjacent access road and directing it to shallow channels that have banana pits at regular intervals. Today he grows mangoes, oranges, papayas, bananas, bans, cowpeas, millet, tomatoes, tobacco, napier (a fodder), besides maize -- all on the same 0.5 hectares. His income has risen seven times. According to Maimbo Mabanga Malesu, regional coordinator, South and Eastern Africa Network, Nairobi. "Saku's initiative has broken the existing myth that small lands cannot yield much."